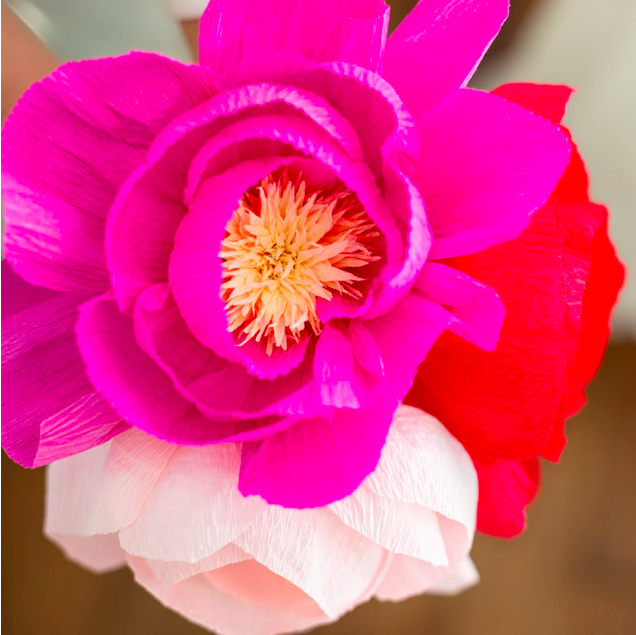 Learn to create gorgeous peony blooms! We can’t wait for peony season. Who’s with us?! Bunches of fragrant, layered petals in dozens of shades of pink…SWOON! Great news- you don’t have to wait till Spring to get your fix. Join us in this workshop to create a bouquet of paper peonies and add a pop of spring color to your home or office to help cure those winter doldrums! In this workshop you will take your paper flower game to the next level and learn how to create gorgeous peonies made from high-quality floral paper. Our instructor will walk you through step-by-step with expert tips and you’ll take home three realistic paper peonies that will last forever. You’ll also receive instructions and templates so you can surround yourself with more blooms and paper flower making fun at home! About the instructor: Briana Lewis Allen is an occupational therapist by trade and currently works as Revel’s Workshop Coordinator and resident paper flower expert. She has loved art and crafting her whole life and enjoys finding ways to incorporate beautiful DIYs into her home decor. When she’s not crafting or helping fellow Revelers find inspiration, Briana enjoys spending time in her garden, cooking, baking, and traveling the world! Follow along with her adventures on Instagram. Registration fee includes all supplies needed for workshop. Beverages and snacks will be available for purchase.